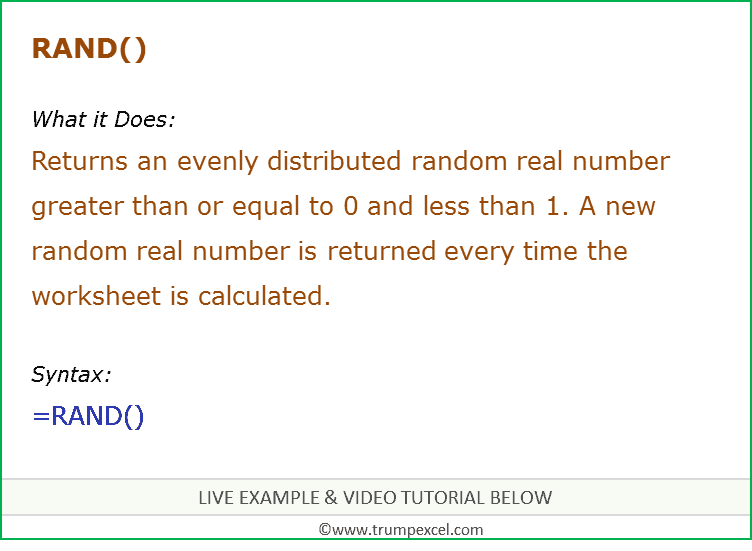 RAND function can be used when you want to generate evenly distributed random numbers between 0 and 1. It returns a number between 0 and 1. RAND function does not take any input arguments. It is used with empty parenthesis. RAND is a volatile function and should be used with caution. It can be forced to recalculate by pressing the F9 key. This recalculates the entire workbook calculations. If you want to use RAND to generate a random number but don’t want the numbers to change every time the cell is recalculated, enter =RAND() in the formula bar, and then press F9 to change the formula to a random number. It is a good function to use when you want to generate values between 0% and 100%.